SEOUL, South Korea - North Korea's No. 2 leader reiterated Thursday his country's pledge to abandon its nuclear weapons, as the country sought a resumption of aid at its first high-level talks with South Korea since conducting an atomic test. Kim Yong Nam said "the denuclearization of the Korean peninsula is the dying wish" of the country's founding president, Kim Il Sung, the father of current leader Kim Jong Il. 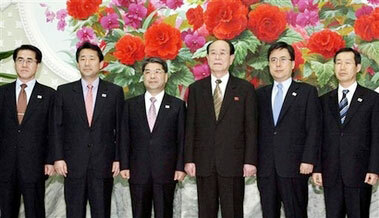 North Korea "will make efforts to realize it," he told South Korean Unification Minister Lee Jae-joung in Pyongyang. Lee pressed for North Korea to follow through on its breakthrough Feb. 13 agreement with the US and four other countries to shut down its sole operating nuclear reactor in 60 days, and to eventually dismantle all its atomic programs. "It is important to make efforts to ensure that South and North Korea cooperate and six countries each assume their responsibilities," Lee said. Kim Yong Nam also called for the two Koreas to work together to reunify the peninsula, which was divided after World War II and remains officially at war since the 1950-53 Korean War ended in a cease-fire, not a peace treaty. As talks resumed Friday, the two sides agreed to resume reunions of families split across their border. A South Korean official said on condition of anonymity due to the sensitivity of the ongoing talks that reunions over a video link will be held this month, with face-to-face meetings set for May. The reunions are a highly emotional issue between the North and South as many of those hoping to see relatives are elderly and running out of time to see their families. Millions of Koreans were separated following the division of the Korean peninsula in 1945 and the 1950-53 Korean War. The North had been expected to agree this week to restarting the reunions, which were put on hold last year after the missile tests. 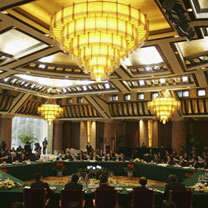 South Korea has been one of the North's main aid sources since the two nations held their first and only summit in 2000. This week's meetings are the 20th Cabinet-level talks since then. But South Korea halted rice and fertilizer shipments to the North after it test-fired a barrage of missiles last July, and relations worsened following North Korea's Oct. 9 underground nuclear test. South Korea has been hesitant at this week's talks, which run through Friday, to immediately restart aid without seeing the North take real steps to dismantle its nuclear program. The North wants to resume separate discussions this month on economic cooperation that would address aid, but South Korea prefers to wait until after April 14 -- the deadline for Pyongyang to switch off its nuclear reactor, pool reports from South Korean journalists at the talks said. However, the South may offer a limited amount of fertilizer if the North agrees to other conditions, the pool reports said. The sides may also agree on conducting trial runs of trains on restored rails across the border. Earlier over dinner, the North's main negotiator at the talks, Senior Cabinet Councilor Kwon Ho Ung, said "a wide road will be opened for the drastic development of North-South relations" if certain measures are implemented. He did not specify them. Last month's six-nation nuclear agreement has raised hopes it will foster a relaxation of regional tensions, since the deal also provides for North Korea to hold talks to normalize ties with Japan and the United States, both of which are scheduled to begin next week. The nuclear pact also calls for negotiations to finally establish a peace agreement between the Koreas. South Korea's President Roh Moo-hyun urged in a speech Thursday in Seoul that the agreement "be successfully implemented so that a peace regime can be firmly established on the Korean peninsula." Amid intense diplomacy to ensure the disarmament deal goes forward, the US State Department's No. 2 diplomat, John Negroponte, arrived in Japan Thursday on the first stop of an Asian trip expected to focus on the North Korea issue. He will also visit South Korea and China. Meanwhile, South Korean Foreign Minister Song Min-soon left Thursday for Washington for talks with Secretary of State Condoleezza Rice on North Korea. He is also set to travel to Moscow.